Since 2014, we have been working with students from agriculture training schools. 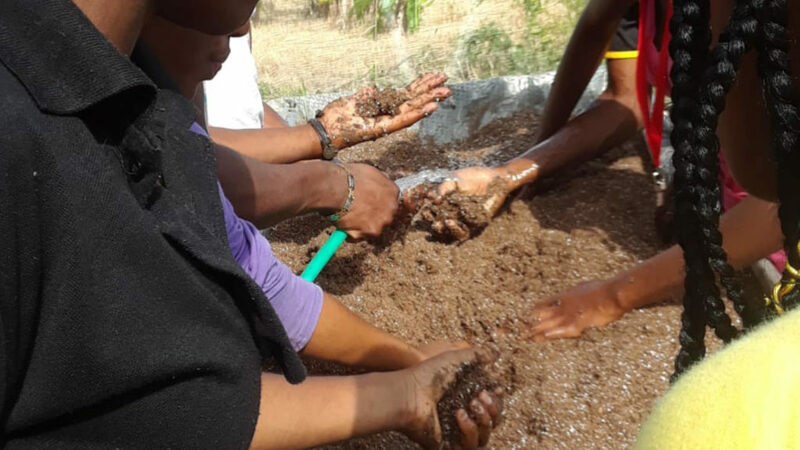 Our pilot farm was still being developed when three young students from the Heart Trust Ebony Park Agriculture School asked us to join our team to learn about organic agriculture. It was new to us because we though that most farmers in Jamaica were elders and we were under the impression that young people did not want to work in such a tedious profession. Since then, we have trained over 400 students between the ages of 18-24 thanks to your support. In 2019, we launched an official partnership with the Heart Trust NTA to train up-to 60 students this year. Heart donated the use of school farmland and 50% of all costs associated with the practical cultivation of organic onions. This production will assist in Jamaica's mandate to reduce the highly imported conventional onion. Sustainability is a major part of the work that we are doing so transitioning the youth from student to agri-entrepreneur is our organization's goal. Students that participate will get the opportunity to partner with each other in their own one-acre farm at the end of the organic onion farm training. With your help, we can kick-start these youth entrepreneurs who will be able to graduate from school and start a profession that will provide significant benefits. The absence of this pivotal type of assistance will contribute to the lack of opportunities that young people currently face. We are engaging youth at the moment where they make the decision to either work for what they want or become the element. Supporting this program is the epitome of contributing sustainably. Your donation will help us kick-start young farmers' careers and give them an opportunity to make a living by making life.